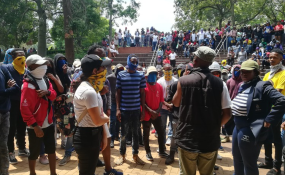 It's the beginning of South Africa's academic year and once again, campuses have been brought to a standstill by students protesting against a host of issues that have plagued the country's universities. These include registration fees, student accommodation, food and other issues, compounded by the inefficiency of the country's student financial aid scheme. In the wake of nationwide campus protests from 2015 to 2017, former president Jacob Zuma's administration opportunistically extended funding for tertiary education to a broader cohort of students. This didn't resolve the government's flawed approach to the students' demand for free higher education. It was inevitable that the promise of "free education" would come back to haunt the government. That's because leaders fail to understand what's really at stake in the demands for genuinely free quality education for all. University administrations expected the government's student funding agency - the National Student Financial Aid Scheme - to solve the problem of affordability. It needn't be this way. We've always argued that free higher education for all is not only desirable, but entirely possible. In our submission to the Heher Commission - a commission instituted by government to advise it on the question of tertiary student funding - we set out a number of recommendations. But these have been ignored. Our view is that public universities are society's key institutions for developing knowledge through their role in research and teaching. By fulfilling these functions, institutions contribute to social, economic, cultural and intellectual development. We argue that free higher education is not an end in itself. Rather, it's essential for the achievement of the social, political, cultural and transformative goals of a society characterised by the legacies of racist oppression and exploitative social relations. We didn't argue for the increase of value added tax as this hits the poor the hardest. We suggested taxing the super rich, where some don't pay the taxes due by them. We argue that the state has the potential - if it has the will - to stop the extraordinary levels of capital outflow. This would provide it with sufficient funds to support free higher education for all and the chronically underfunded universities. The present situation -- where thousands of students are turned away while others are drowning in debt - is simply untenable. It deepens the crisis faced by students. University managements should make common cause with students and pressurise the state instead of relying on charity, band-aid solutions or even worse, the violence of private security. All of these are unsustainable. The state's continued indecisiveness and unwillingness to engage with carefully researched and argued proposals from those within the higher education sector does not bode well for change. Using the bureaucratic devices of National Student Financial Aid Scheme to mediate this crisis will fail and only deepen social conflict.